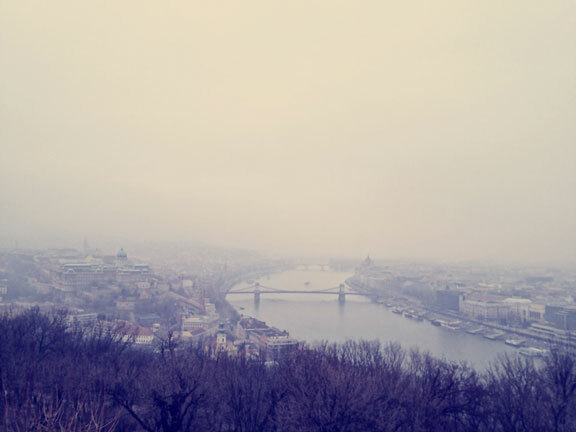 Budapest is a majestic city; brilliant like an expertly cut diamond and just as edgy. 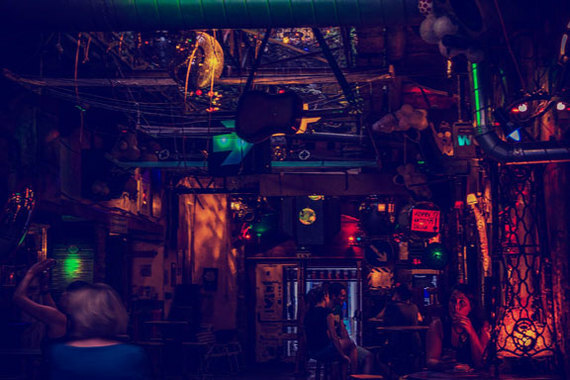 There is as much enjoyment to be found visiting the city's condemned tenement buildings or abandoned factories (the ruin pub scene) as there is in viewing Budapest's many striking landmarks. 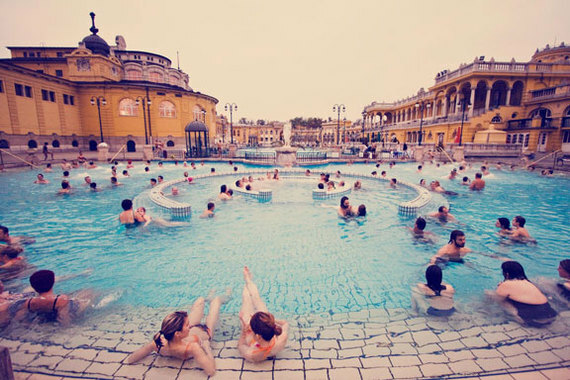 The Széchenyi Bath and Spa complex is a grand Neo-Baroque palatial structure hosting 21 different thermal baths of varying temperature and mineral composition. The building is painted pastel yellow, as if stained by the strong scented sulphates that rise from gated vents in the ground. The great majority (18) of Széchenyi's pools are indoor. For this reason it is best to treat the interior bathing area like a tasting session at a brewery, or a whiskey distillery. Walk through the labyrinth of different sized rooms and spend a minute or two relaxing in each pool, sauna or steam room. But the outdoor area is Széchenyi's true crowning glory. There are few better things in life than floating around in the 38°C outdoor thermal pool whilst powdered beads of falling snow meet with thick sulphuric steam clouds streaming from the water's surface to melt before your eyes. The contrast in temperature can lead to a heightened sense of touch and the water's mineral content can loosen stiff joints and muscles. Look out for gregarious old men with grey beards sat in the water engaged in tense games of chess. 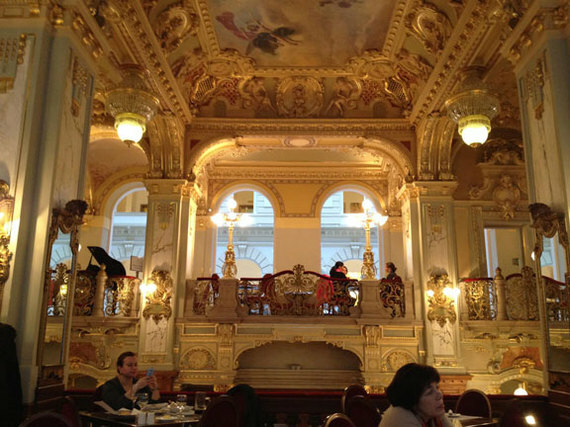 The lavish New York Café on Ersébet körút reflects beautifully on the opulence of fin de siècle Budapest. Following the unification of three cities in close proximity - Buda and Óbuda on the west of the river and Pest on the east - the city experienced a golden age of prosperity. 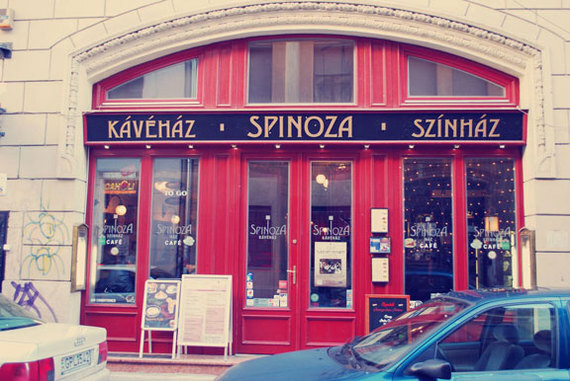 Unified Budapest was the twin capital of the powerful Austro-Hungarian Empire and as such it benefitted from rapid economic growth, which, like many other European cities of the time, helped foster a thriving coffee house culture. Sit at one of the Grand Café's immodest tables and gaze at the establishment's extravagant gold and marble interior over a surprisingly modestly priced espresso and let the crisp notes of an ivory piano take you back to the turn of the century when successful Hungarian writers, artists and actors would frequent this ornate café to plan their masterpieces. 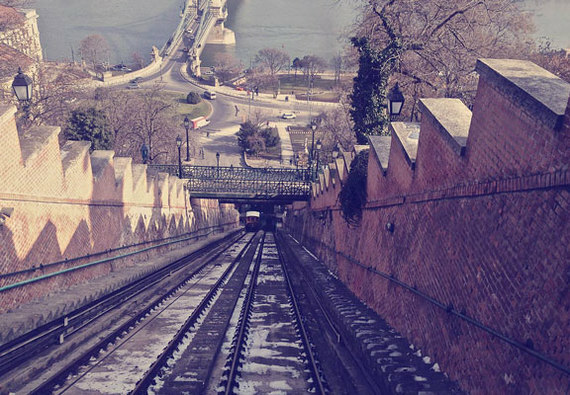 Originally opened in 1870 to help commuters get from the Chain Bridge to the top of Castle Hill, without risking heart attack, the Funicular cliff railway is a fun addition to the city's public transport roster. Being tugged up a precipitous hill by cable is less scary and more enjoyable than it sounds! 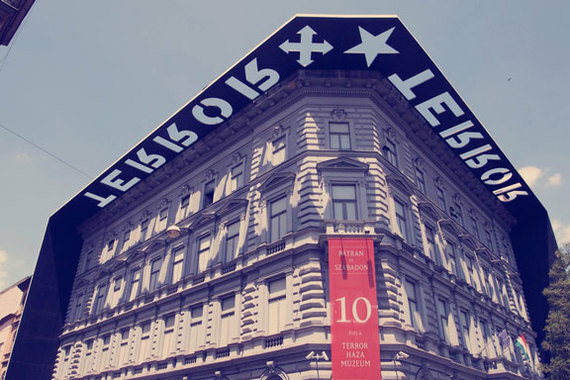 While walking along the handsome tree-lined straight of Andrassy Avenue, look to the sky and eventually you will find the House of Terror Museum, where sunlight shines through a metal fascia to project the word 'TERROR' onto the street. This is designed to represent the terror that was projected onto the people of Hungary by the totalitarian regimes of the 20th Century. The building, 60 Andrassy Avenue, was used as a headquarters for the Nazi party from 1944-1945 and the basement: a prison. The House of Terror does deal with the atrocities committed by the Nazis but the bulk of the exhibition is dedicated to the period between 1945-1991 when the Soviet Union used the address as a centre for State Security and as a torture chamber. The Buda side of the Danube has a distinctly different atmosphere to the opposite side of the river in Pest. Cafes, galleries, restaurants, museums, shops and offices lend Pest a metropolitan buzz, whilst Buda enjoys a quieter, more serene ambiance. Perhaps because it sits in the shadow of Gellért Hill. Gellért Hill is a 771-foot high slab of dolomite rock with amazing views. It is said that the peak is named after a saintly bishop called St Gerard, who was unceremoniously rolled down the cliff face in a barrel by pagans in 1046. Once the location of a brutal walled-in Jewish Ghetto, the seventh district, Erzsébetváros, now plays host to the city's trendiest craft beer venues, wine bars, coffee shops and the ruin pubs of Budapest. Despite the deluge of crazy bars and clubs sprouting from the cracks of former factories and abandoned flats, the seventh district still remains true to its historical identity as Budapest's Jewish Quarter. The Dohány Street Synagogue, the largest functioning synagogue in Europe and second largest in the world, attests to this as does the presence of many customary restaurants and bake houses. Spinoza Café is a great example of a traditional restaurant thriving in the ever-changing seventh district. The chefs serve delicious Hungarian and Jewish comfort food at affordable prices and two house pianists provide the room a sophisticated atmosphere. Szimpla Kert, Simple Garden in English, was born at the beginning of the 21st Century out of a simple desire to create a multi-disciplinary creative space where people could come and enjoy a cheap drink in a relaxing yet stimulating environment. Short of cash themselves, the founders decided to open their pub in the ruins of a condemned factory in the seventh district. They decorated it with bright lights, old road signs, discarded computer parts, Soviet ephemerae, hanging bicycles and local artworks. This fascinating postmodern coming together of traditional objects, technology and creativity gives the space an enchanting ambiance. The messages of mainstream mediums such as television and official signage are morphed into something altogether more inspiring, just as the cracked walls of the dilapidated building are transformed into something dynamic and fresh. Depending on what day of the week, or time of day it is, you can expect to find many kinds of grassroots entertainment, such as live concerts, open-air cinema screenings, theatre performances and even a famous farmer's market (on Sundays). This article originally appeared on Tiny Traveller. You can view the full article with additional photos here. Follow the Tiny Traveller's adventures on Instagram, Pinterest, and Facebook.